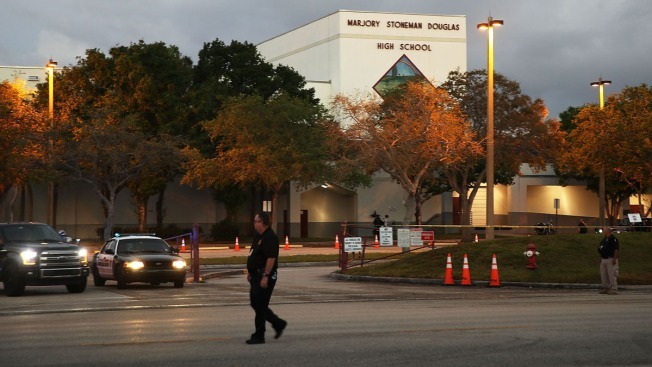 This Feb. 28, 2018, file photo shows police officers in front of Marjory Stoneman Douglas High School as students arrived to attend classes for the first time since the shooting that killed 17 people on February 14 at the school in Parkland, Florida. Two student reporters who covered a mass shooting at their Parkland, Florida, high school have gotten a special invitation to share their experiences and learn from professionals at a week-long journalism program in New York. Stony Brook University says Zoe Gordon and Taylor Yon will be among about two dozen students participating in the Robert W. Greene Institute for High School Journalists beginning July 15. Howard Schneider, dean of the university's journalism school, says Gordon and Yon were invited to what's been mainly a program for New York-area students as an expression of support for the journalism program at Marjory Stoneman Douglas High School. The 15-year-old Gordon and 16-year-old Yon are rising juniors at Stoneman Douglas and reported on the February shooting that killed 17 students and staff members for the Eagle Eye school newspaper.